The Laténium in Hauterive on the shores of Lake Neuchatel combines a free archeological park with a very interesting museum of Swiss history from the Renaissance back to the times of the Neanderthal man. The Laténium is a very interesting museum of Swiss archeology as well as the history of man in the Lake Neuchâtel (Neuenburg) region. The museum covers history from the Renaissance (around AD 1600) back to the ice age (around 100,000 BC). The larger exhibitions are on the Gallo-Romans, Celts, and Bronze Age. The Laténium museum has numerous interactive displays, which can entertain adults and children of all ages. 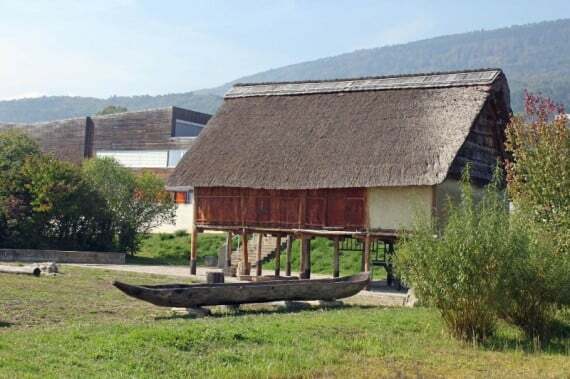 A large park (free) between the museum and the shores of Lac de Neuchâtel has further archeological displays including reconstructed houses from the Bronze Age. Transportation to the Laténium from Neuchatel city is easy by car, bus (fast), or boat (free). The Laténium and park is a great day-trip destination and popular with families. 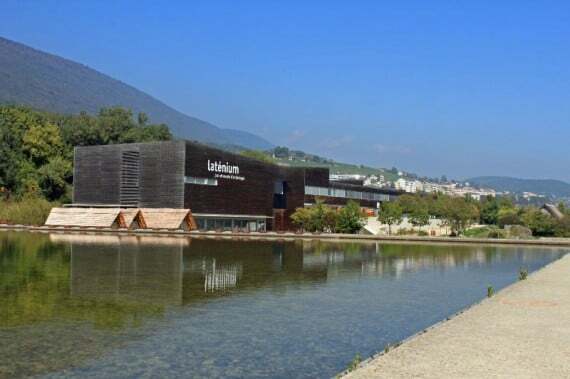 The Laténium is a large, modern archeological museum with a park on the shores of Lake Neuchatel in Switzerland. 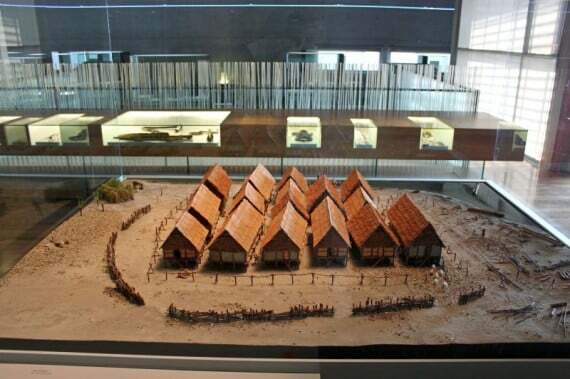 The museum opened in 2001 to exhibit the surprisingly large collection of artifacts and archeological finds mostly from the Canton Neuchatel area from the ice age to around AD 1600. 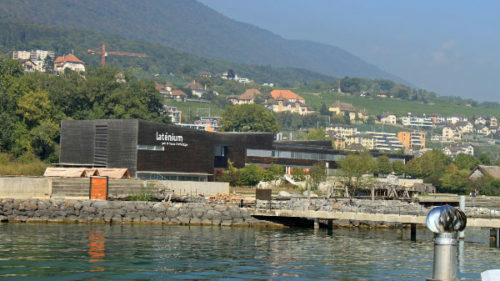 The name Laténium is derived from La Tène, a very important archeological site on the opposite side of Lake Neuchatel from the museum. La Tène gave its name to the Celtic culture that spread though most of Europe during the second Iron Age. Many items found at La Tène are on display in the Laténium. A glance at a typographical, rather than modern political map of Europe helps to explain why so many pre-historical and Gallo-Roman items have been found in the Lake Neuchatel area. Until political boundaries altered trade routes, Neuchatel has been on the major and shortest routes from Italy and Southern France to Germany. Vineyards on the northern slopes of Lake Neuchatel also confirm that the weather here is more moderate than many visitors would expect from Switzerland. Modern political boundaries also influence the items on show in the museum – the focus is on items found in the modern-day canton Neuchatel. Similar items from similar periods from nearby areas require separate (and enjoyable) trips to museum in other political entities such as Besancon in France; Yverdon-les-Bains, Avenches, Orbe, and Lausanne in canton Vaud; and Biel/Bienne in canton Bern. The Middle Ages exhibition covers the period AD 1600 to AD 476, i.e. from the end of the Roman era to the early Renaissance. The emphasis here is very much on Canton Neuchatel with models of the major towns, art, and a large collection of medieval tiles. The Gallo-Roman era (AD 476 to AD 1) exhibition has the typical items found in Roman history museum all over Europe, including coins, pottery, glass, and models of villas. 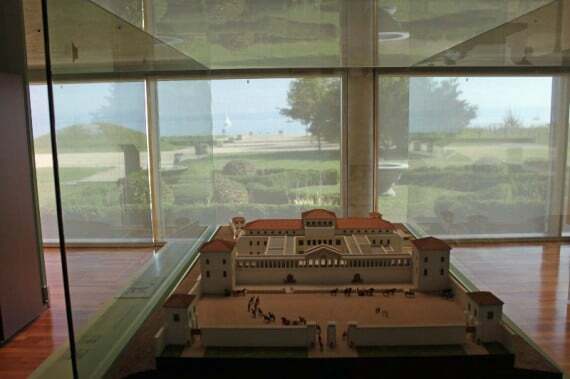 The Colombier Villa with baths, which were to the south of Neuchatel, is considered to have been one of the most impressive Roman villas in Switzerland, as is confirmed by the large scale model. The Celts from La Tène (1 to 800 BC) exhibition has mainly items found at the Iron Age archaeological site of La Tène located on the opposite bank of the lake from the museum. The exhibits show both the violent and artistic nature of the Celtic culture. The Lake Dwellers (800 to 5500 BC) covers the Bronze Era to the Neolithic. Evidence of several lake-side communities and buildings on poles exists in the Neuchatel region. Exhibits here show how a typical town and household would have functioned during this era. The Hunters (5500 to 13000 BC) has a large collection of hunting implements and animal bones from the Mesolithic back to the Magdalénien. Switzerland under Ice (13,000 to 40,000 BC) is a small exhibition on how virtually all of Switzerland was covered by ice during this period. The Country of the Big Bears (40,000 to 100,000 BC) is a small exhibition with a few items that hints of the oldest human activity in Switzerland. Bones from 62 animal species, including of course big bears, were found in a cave at Cotencher. The Neanderthals reached the Neuchatel region around 90,000 BC. The displays in the Laténium are well designed and it is easy to follow the general chronological flow through the museum without having to back track. The majority of items are displayed in the traditional way behind glass with descriptions but many interactive models, computer quizzes, and toys are scattered throughout the museum to entertain visitors of all ages. Children will also find much to enjoy in the museum. All items in the Laténium are described fully in both French and German. An English audio guide is available and good value for visitors not able to understand either French or German. 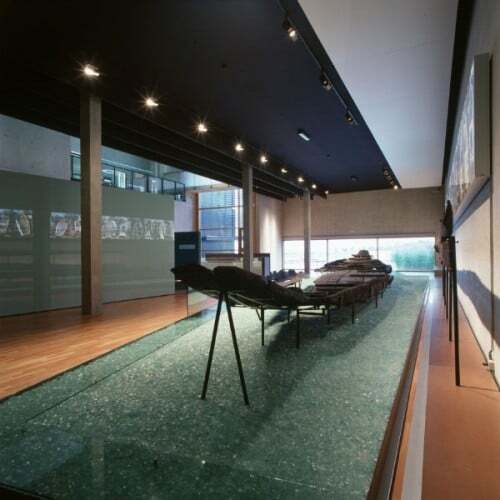 The Laténium is fully accessible for wheelchair users. Parents with buggies / strollers also benefit from the access ramps. The museum and park are family friendly with many toys inside the museum area and a small play area in front of the café terrace. Children generally enjoy arriving by boat (free) too. 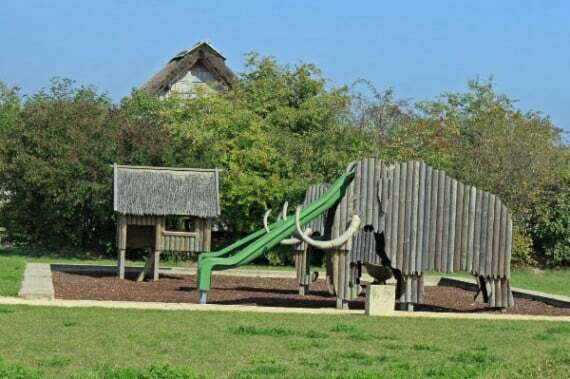 The large park between the museum building and the shores of Lake Neuchatel include archeological items found in the region as well as models of houses from the Neolithic period. A reflecting pool shows how high the water level of Lake Neuchatel was up to around a century ago. The Laténium recommends visits lasting from an hour to a day but few visitors would be able to see much of the park and museum in less than two hours. A small café is available with drinks and small snacks. The Laténium Museum of Archeology is open Tuesday to Sunday from 10 am to 5 pm. The museum is open on most vacation days (including Mondays). Admission is CHF9 for adults, CHF5 for students, CHF4 for children 7 to 16, and CHF20 for families (parents with own children). The Swiss Museum Pass and Neuchatel Museum Card are valid. Admission is free on the first Sunday of each month for visitors entering the Laténium before noon. The park is freely accessible at all hours and free for all visitors. Getting to the Laténium is easy by car, bus, or boat from Neuchatel. 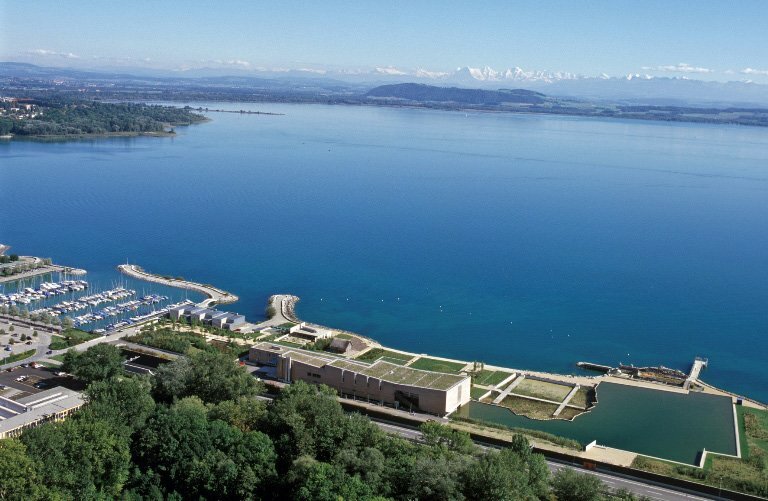 The museum is around 3 km northeast of downtown Neuchatel in the community Hauterive on the shores of Lake Neuchatel. Drivers should follow the lakeside road from Neuchatel towards Marin and Bienne/Biel or the Hauterive exit from Autoroute A5. Parking is available at the museum or at the large parking lot at Port d’Hauterive. Arriving by boat is probably the most pleasant (and cheapest!) way to visit the Laténium. During summer, boats are available three times per day from Neuchatel to Hauterive. Travelers currently enjoy this 15-minute cruise for free. Boats on the route Neuchâtel / Neuenburg to Morat / Murten or Neuchatel to Biel / Bienne usually stop at Hautrive. The boat landing is in the park at the Laténium.